NFC (Near Field Communication) is a technology enabling short-range wireless communication between various devices, such as smartphones and IC tags. Thanks to the NFC function, data communication (for example, Bluetooth pairing and connection) can be achieved easily by simply touching NFC-compatible devices together (i.e., at the N-mark symbol or location designated on each device). Unlock the screen of the NFC-compatible device in advance. Touch the N-mark symbol on the NFC-compatible device to the N-mark symbol on the speaker until the NFC-compatible device vibrates (this might take a few seconds). Follow the on-screen instructions to establish a Bluetooth connection. When the Bluetooth connection is established, the Bluetooth LED goes out. 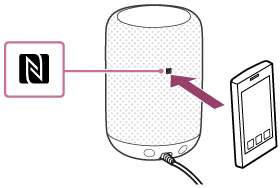 To disconnect the Bluetooth connection, touch the N-mark symbol on the NFC-compatible device to the N-mark symbol on the speaker once again. In order to use your speaker as a Bluetooth wireless speaker, you must first finalise the Wi-Fi setup using the Google Home app. You can pair and connect your wireless speaker with a BLUETOOTH® device and use the speaker as an external speaker for the connected device. Pairing is the process required to mutually register the information on Bluetooth devices to be connected wirelessly. It is necessary to pair the speaker with a Bluetooth device in order to establish a Bluetooth connection for the first time. The speaker can be paired with up to 8 Bluetooth devices. When pairing with 2 or more Bluetooth devices, perform the following procedure for each device. Place the Bluetooth device within 1 m (3 ft.) from the speaker. Stop playback on the Bluetooth device. Turn down the volume of the Bluetooth device and the speaker to avoid any sudden loud sound output from the speaker. Depending on the paired Bluetooth device, the volume of the Bluetooth device may be synchronized with the volume of the speaker when you start playing music after a Bluetooth connection is established. Make sure that both devices are connected to the same Wi-Fi network when pairing them for the first time. Perform the pairing procedure on your Bluetooth device to detect the speaker. When a list of detected devices appears on the display of the Bluetooth device, select the name of the speaker. The pairing information of the speaker is deleted from the Bluetooth device. 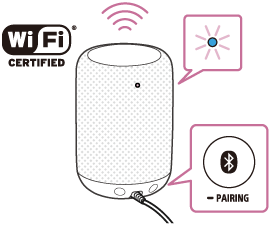 The speaker can be paired with multiple devices, but can only have an active Bluetooth connection with one paired device at a time.